Although this post is most unskeptical and decidedly noncardiac, the skeptical cardiologist feels compelled to share this information with readers who have or know friends or family with eczema or atopic determatitis, a chronic skin condition that results in itchy, scaly, dry and red skin. For most of my life I have dealt with periodic flare-ups of eczema along with continuously itchy skin . Control of flare-ups was by meticulous attention to keeping my skin clean and moisturized along with frequent applications of topical corticosteroids. Things worsened a few years ago and I began to think I might have Red Skin Syndrome, which some dermatologist believe is due to withdrawal from topical corticosteroids. Two months ago, however, my spirits brightened when I heard that the FDA had approved a new biologic injectable called Dupixent (dupilumab), to treat adults with moderate-to-severe eczema (atopic dermatitis), whose eczema is not controlled adequately by topical steroids. My fantastic dermatologist, Dr. Amy Ney, agreed this was appropriate therapy for me, and within a week I received a refrigerated package containing the initial dosage: two syringes filled with the drug. 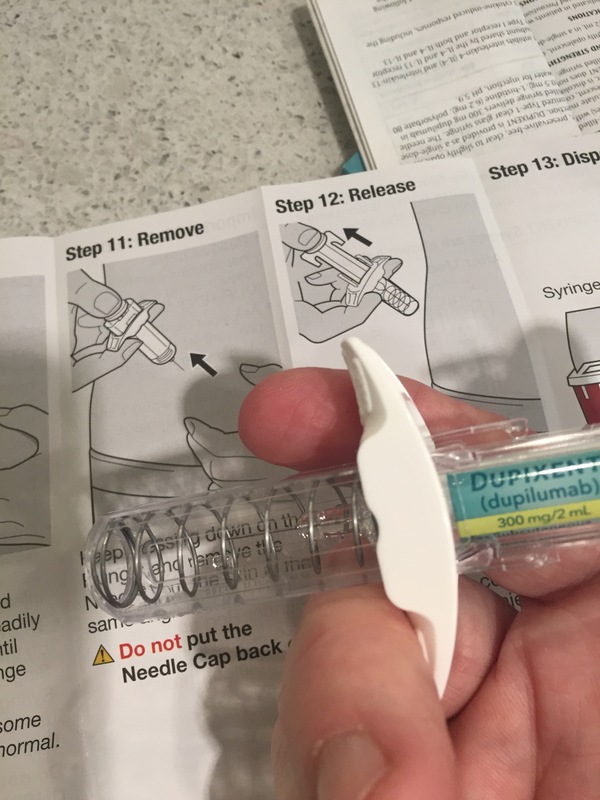 The pre-loaded syringe filled with Dupixent. The syringes come with very detailed instructions to guide you through the process of injecting the liquid into either the abdominal region or the thighs. Within a week of injecting the contents of the syringes into my abdomen, my itching ceased and I had no more eczematous rashes. For me this was a minor miracle. Since then I’ve injected one 300 mg syringe every two weeks and I continue to be free of my life-long signs and symptoms of eczema. The cause of atopic dermatitis is a combination of genetic, immune and environmental factors. In atopic dermatitis, the skin develops red, scaly and crusted bumps, which are extremely itchy. Scratching leads to swelling, cracking, “weeping” clear fluid, and finally, coarsening and thickening of the skin. Dupixent’s active ingredient is an antibody (dupilumab) that binds to a protein [interleukin-4 (IL-4) receptor alpha subunit (IL-4Ra)], that causes inflammation. By binding to this protein, Dupixent is able to inhibit the inflammatory response that plays a role in the development of atopic dermatitis. Dupixent acts by inhibiting two cytokines that are responsible for the hyperimmune response in skin. They are called IL-4 and IL-13. IL is an abbreviation for interleukins, proteins that are produced by leukocytes (3) and play a part in regulation of the immune system. Steroids, such as prednisone, also suppress the immune system, but taking them for an extended period of time will get you into trouble. (See: Prednisone: Satan’s Little Helper) Unlike prednisone, Dupixent inhibits specific targets. It works more like a scalpel than a bomb. One participant in the trial, Lisa Tannebaum, a 53-year-old harpist in Stamford, Conn., was so thrilled that she wrote a letter to Regeneron suggesting they use her before and after photographs in advertisements. She developed a severe form of the disease 14 years ago and tried everything imaginable in conventional and alternative medicine without relief — specialized diets, immunosuppressive drugs, special clothing, bleach baths. She even had the gold fillings removed from her teeth on the theory that they may be causing an allergic response, but to no avail. Now, she is performing again and will be playing her harp at Carnegie Hall on Oct. 30. Of course we can’t rely on anecdotes to prove the safety and efficacy of drugs: we need randomized, controlled, double-blind studies. Dupixent has three such clinical trials with a total of 2,119 adult participants, and the results were remarkable. (for details see here). Overall, participants who received Dupixent achieved greater response, defined as clear or almost clear skin, and experienced a reduction in itch after 16 weeks of treatment. 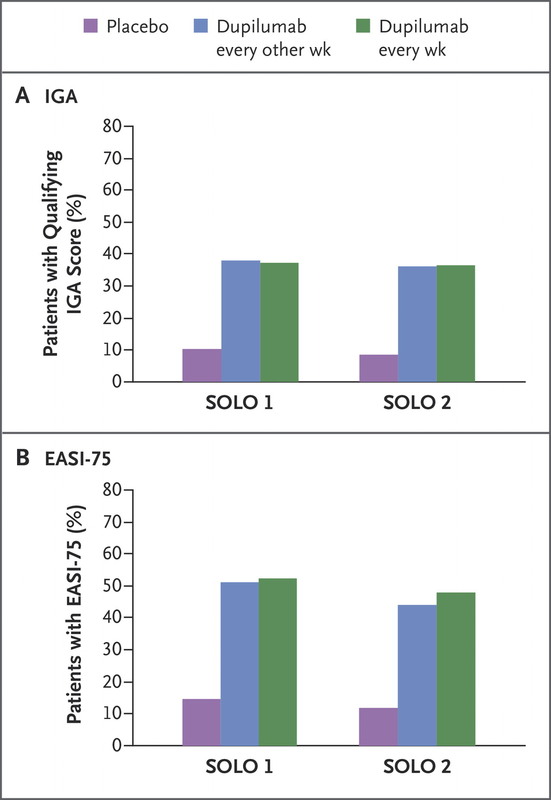 Panel A shows the proportions of patients with the primary end point (both a score of 0 or 1 [clear or almost clear] on the Investigator’s Global Assessment [IGA; scores range from 0 to 4, with higher scores indicating more severe disease] and a reduction from baseline of 2 points or more on the IGA at week 16) among patients who received dupilumab every week, dupilumab every other week, or placebo in SOLO 1 and SOLO 2. Panel B shows the proportions of patients with the key secondary end point (which was considered to be a coprimary end point by regulators in the European Union and Japan) of an improvement from baseline of at least 75% on the Eczema Area and Severity Index (EASI-75) at week 16 in the two trials. P<0.001 for all comparisons between dupilumab and placebo. For binary end points, patients who received rescue medications or withdrew from the study were categorized as having had no response, as were those with all other missing values. The only side effect which was more common with Dupixent than placebo was conjunctivitis, an inflammation of the eye. When I first read of this drug I assumed it would be horribly expensive. In cardiology we have two injectable biologics (Repatha and Praluent, PCSK9 inhibitors) for lowering cholesterol, which typically have been costing my patients with insurance coverage over 1000$ per month. Fortunately Sanofi/Regeneron have learned from prior experience and priced the drug at $37,000, a number that insurance companies have apparently warmly welcomed. 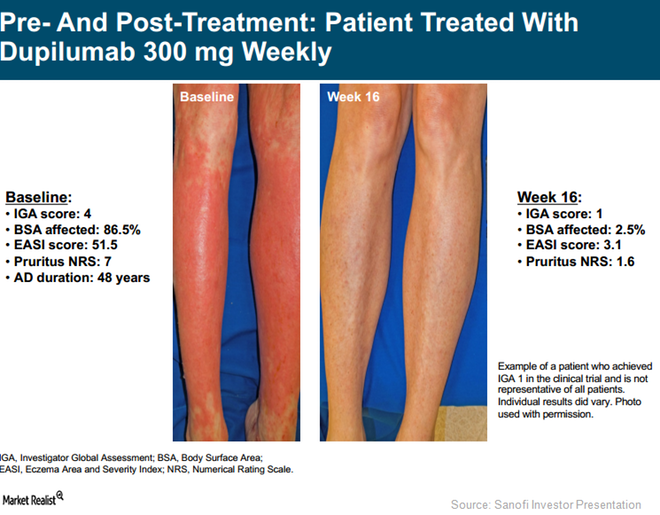 This article suggests that the drug is priced significantly lower than newer biologics now available for psoriasis and rheumatoid arthritis. With my insurance (United Health Care) coverage I was asked to pay 150$ for 2 injections per month. I then discovered that Sanofi has a co-pay card that covers that 150$ so that for now I am paying zero dollars out of the 37,000$. I’m paying nothing for a brand new biologic injectable that has cured my eczema. Now that is miraculous! N.B. Featured Image before and after hand is from National Eczema organization and is not of my hand. I am so happy you finally have relief from eczema. It is wonderful to be free from chronic pain. Happy this worked for you Dr Anthony! Forwarding to my 24 yr old son who has struggled with eczema throughout life. I would be shocked if his health insurance covers this medication, but it may encourage him to continue to work with a dermatologist for relief. I think he has given up…. Hi Dr Anthony P, this was such a great article to read regarding the potential to cure eczema. What you’re your thoughts around the prescription of topical cortisone steroids currently which seems to be the go-to option for doctors and dermatologists? I’ve heard many stories around topical steroid prescription and red skin syndrome. On my page https://wordpress.com/view/addiction2prescriptiontopicalsteroids.wordpress.com there are some anecdotes and stories from medical specialists surrounding the dangers of patients using topical steroids. Is there a danger of dupixent also holding similar side effects for patients too? Are there other factors which can make topical steroids dangerous for certain patients? Because I was an early adopter of Dupixent, it is possible that there will be significant side effects emerge from the drugs use that I was unaware of. I am willing to take that chance given how much better I feel overall. The drug is not a panacea and I need to write a follow up post that deals with my long term experience with it. For now, be aware that it seems to worsen allergic conjunctivitis. Thank you doctor for this eye opening article. My eczema seems to come and go and now has stuck around. I will discuss with my dermatologist soon. Glad you are feeling much better. Maybe I can join you. Do you think diet has anything to do with flare ups or eczema in general? First off, let me say that I am no eczema expert. Prior to Dupixent, when my eczema was really bad I searched long and hard for dietary causes.I read extensively on the topic. I put my self on an elimination diet with little or no change.I think that is the best approach to identifying any dietary triggers. My final conclusion was that excess alcohol (especially botanical liquors) was likely a trigger and pistachio nuts also likely a trigger. Thanks, doc. Keep up the great work. I am virtually completely clear of topical steroids. No steroid withdrawal symptoms. I have developed an annoying red patch on my forehead. I will not use steroids on it and it persists. It’s not clear to me if this is related to the Dupixent. Your Dupixent article is useful and informative. I am responding to your 1/27/2018 comment — I have also developed eczema patches on my forehead and around my nose in addition to irritated eyes. Otherwise, Dupixent has delivered me from 65 years of suffering. The change on my hands has been amazing. I’m going to update this post at some point with my ongoing experience. I searched long and hard for any mention of forehead patches and could find nothing that duplicated my experience until your comments. I’m glad Dupixent has mostly worked for you like me. Since my last comment on this I had it biopsied and it showed evidence for contact hypersensitivity suggesting a reaction to a topical substance. Subsequently I tried eliminating using Elidel which was really the only thing I was using prior to the biopsy and that didn’t help. ultimately i have started using as little as possible a small amount of steroid cream and that helps it a lot. I’ve also been experimenting with Eucrisa and think that helps a little. I’m also on Dupixent and it’s a complete game-changer for me. I have conjunctivitis, but it’s a small price to pay for no itching. I’ve been on Dupixent since April 2017, and I’ve seen no change in the effectiveness since then. I do have a small patch of red skin on one of my temples, but it’s not itchy. I’m not on any steroids or Elidel anymore; it’s fantastic!! Just wanted to share my experience as well for those that have severe eczema that can’t be controlled any other way.